Now that NASA's Mars Exploration Rover Spirit is finally examining bedrock in the "Columbia Hills," it is finding evidence that water thoroughly altered some rocks in Mars' Gusev Crater. Spirit and its twin, Opportunity, completed successful three-month primary missions on Mars in April and are returning bonus results during extended missions. They remain in good health though beginning to show signs of wear. On Opportunity, a tool for exposing the insides of rocks stopped working Sunday, but engineers are optimistic that the most likely diagnosis is a problem that can be fixed soon. "It looks like there's a pebble trapped between the cutting heads of the rock abrasion tool," said Chris Salvo, rover mission manager at NASA's Jet Propulsion Laboratory, Pasadena, Calif. "We think we can treat it by turning the heads in reverse, but we are still evaluating the best approach to remedy the situation. There are several options available to us." Opportunity originally landed right beside exposed bedrock and promptly found evidence there for an ancient body of saltwater. On the other hand, it took Spirit half a year of driving across a martian plain to reach bedrock in Gusev Crater. Now, Spirit's initial inspection of an outcrop called "Clovis" on a hill about 9 meters (30 feet) above the plain suggests that water may once have been active at Gusev. "We have evidence that interaction with liquid water changed the composition of this rock," said Dr. Steve Squyres of Cornell University, Ithaca, N.Y., principal investigator for the science instruments on both rovers. "This is different from the rocks out on the plain, where we saw coatings and veins apparently due to effects of a small amount of water. Here, we have a more thorough, deeper alteration, suggesting much more water." Squyres said, "To really understand the conditions that altered Clovis, we'd like to know what it was like before the alteration. We have the 'after.' Now we want the 'before.' If we're lucky, there may be rocks nearby that will give us that." Dr. Doug Ming, a rover science team member from NASA's Johnson Space Center, Houston, said indications of water affecting Clovis come from analyzing the rock's surface and interior with Spirit's alpha particle X-ray spectrometer and finding relatively high levels of bromine, sulfur and chlorine inside the rock. 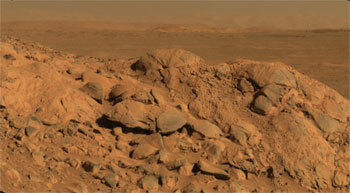 He said, "This is also a very soft rock, not like the basaltic rocks seen back on the plains of Gusev Crater. It appears to be highly altered." Rover team members described the golf-cart-sized robots' status and recent findings in a briefing at JPL today. Opportunity has completed a transect through layers of rock exposed in the southern inner slope of stadium-sized "Endurance Crater." The rocks examined range from outcrops near the rim down through progressively older and older layers to the lowest accessible outcrop, called "Axel Heiberg" after a Canadian Arctic island. "We found different compositions in different layers," said Dr. Ralf Gellert, of Max-Planck-Institut fur Chemie, Mainz, Germany. Chlorine concentration increased up to threefold in middle layers. Magnesium and sulfur declined nearly in parallel with each other in older layers, suggesting those two elements may have been dissolved and removed by water. Small, gray stone spheres nicknamed "blueberries" are plentiful in Endurance just as they were at Opportunity's smaller landing-site crater, "Eagle." Pictures from the rover's microscopic imager show a new variation on the blueberries throughout a reddish-tan slab called "Bylot" in the Axel Heiberg outcrop. "They're rougher textured, they vary more in size, and they're the color of the rock, instead of gray," said Zoe Learner, a science team collaborator from Cornell. "We've noticed that in some cases where these are eroding, you can see a regular blueberry or a berry fragment inside." One possibility is that a water-related process has added a coarser outer layer to the blueberries, she said, adding, "It's still really a mystery." JPL, a division of the California Institute of Technology in Pasadena, manages the Mars Exploration Rover project for NASA's Science Mission Directorate, Washington. Images and additional information about the project are available from JPL at http://marsrovers.jpl.nasa.gov and from Cornell University at http://athena.cornell.edu .